← Friday Morning Correction: It’s Granite. Among the slides that Alex Dessler brought in a few weeks ago were these beauties. 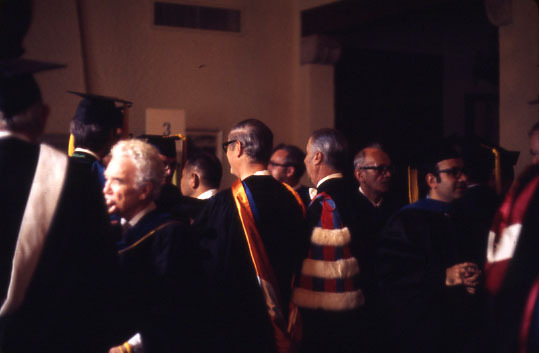 While there have been many images taken over the years of Rice faculty wearing regalia, they are almost always either in procession or on the podium. Aside from the ones I’ve taken myself I can recall only one picture of faculty members preparing for their role in the ceremony, a moment that I find oddly touching. That first photo is a little puzzling to me. Each faculty member’s regalia is specific to the school where s/he earned the PhD (or other final degree), but it looks like there’s just a pile they’re grabbing from. I heard a rumor not too long ago that if a faculty member is not going to be present at Rice’s commencement, s/he has to write a letter to the President explaining why. True? 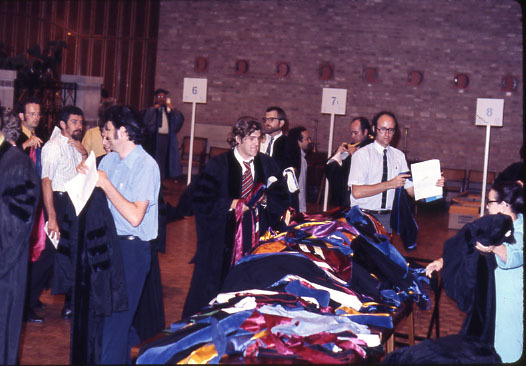 I would guess that the faculty in the first photo are returning their regalia – hence the disorganized pile. The woman to the right appears to be collecting piles of regalia. That’s even better! I’ve never seen a picture of that before. That’s certainly Sidney Burrus fronting picture #3. And the guy in front of Sidney is trustee Jim Teague. 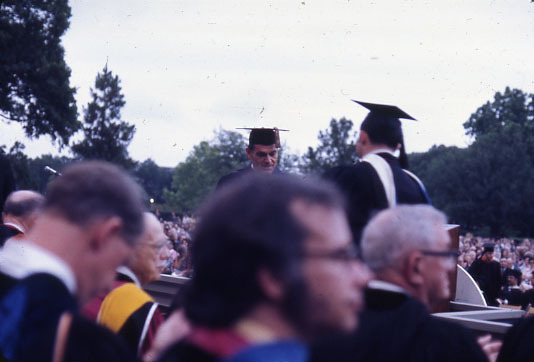 The one behind his head with yellow on his regalia is Carey Croneis, professor of geology and provost. Thanks, Keith, for clarifying that top photo! Is that Terry Doody in the center, with the red-and-blue striped tie? This could have been my graduation! 1971? Yes, they’re labeled. And I certainly trust Alex Dessler—he’s a little on the methodical side. You won’t see this scene again. While some faculty members own their regalia, most use regalia rented for them by Rice. When the bookstore was owned by Rice, it would designate one or two drop-off points where huge piles of robes, hoods, and hats would accrue. Now that the bookstore is owned independently, the collection process is more systematic. Faculty return regalia to their departments. Departments return it to the bookstore. The bookstore, I presume, accounts for missing regalia. I recognize one faculty member in your middle photo, as I ought to, because he is John Kilpatrick, professor of chemistry from 1948-1985, and my father. If you look at the person who in standing in back off and in between the two gentlemen in the middle of the photo who are wearing the colorful gowns, you can see my father’s profile very clearly. To answer my old classmate Katherine Eggert’s question, as I understand it the commencement exercises are considered part of the academic year (as is O-week) and if a faculty member is going to be leaving before commencement or arriving after O-week they have to apply through their department chair to the President for a leave of absence for the period. I don’t know whether that’s just a rubber-stamp (to mention something recently discussed) or if it’s actively discouraged. I suspect the latter but can’t prove it. I think they expect most faculty to show up and they need to know if someone isn’t going to be there. In the top photo, might the balding fellow in the right-center, wearing a white short-sleeved shirt with a skinny tie … and appears to be pointing with his right hand to a piece of paper he’s holding in his left … be Robert Kapp, the professor of Chinese culture/politics who was a Rice for a few years around that time?